A new report, Closing the California Clean Energy Divide by California Housing Partnership, Center for Sustainable Energy (CSE), and Clean Energy Group finds that affordable multifamily-housing property owners in two utility territories – Southern California Edison and San Diego Gas & Electric – have the potential to increase savings by nearly 100% over solar-alone by adding storage, while increasing upfront investment by less than 30%, essentially eliminating their annual electric bills. This report is particularly exciting given recent information on the energy burden of low-income communities (often living in multi-family affordable housing), as well as new state resources going towards multi-family solar through AB 693. A particularly compelling chart from the report, showing changes in costs, savings, and paybacks achieved by adding energy storage to solar installations in PG&E, SCE and SDG&E territories is copied below. 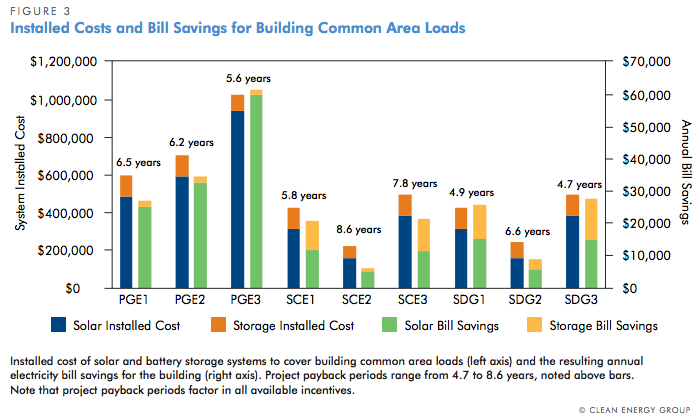 In some cases, pairing solar with storage reduces the payback by three years. The report is available in full here. To register for a June 15th webinar overview of the findings, click here. For more on energy storage (including installs at schools, jails, and museums in California), click here. For innovative projects to reduce energy burdens in public housing, check out Woodland’s zero net energy housing for agricultural workers, or energy efficiency projects being implemented through the Mendocino and Lake Counties Energy Watch local government partnership with PG&E. Report: Does Information Provision Shrink the Energy Efficiency Gap?